As you might know, Doctors Health Press devotes an entire newsletter to Traditional Chinese Medicine. 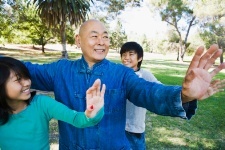 Regular readers will certainly know the name “tai chi” and its vast health benefits. Here we have a health breakthrough in this area: researchers have found that this ancient practice may reduce falls among stroke survivors. Tai chi is a form of qigong, which is a martial art that is more of a soft, gentle dance meant to be meditative and bring your body’s qi in line. Its slow physical movements are blended with mental concentration and focused breathing. After a stroke, people can have difficulty finding and maintaining their balance. Stroke survivors experience seven-times as many falls every year as healthy adults. Falls can range from minor inconveniences to serious events. Bone fractures and hospitalizations can result. PLUS: How qigong applies to breast cancer patients as well. Tai chi has significantly reduced falls in healthy older adults. The practice can effectively improve balance, which is an important factor in preventing falls. It is available in group sessions in most U.S. cities, and it is also available in video form online and on DVDs. Plus, tai chi isn’t expensive. The study recruited 89 stroke survivors, averaging the age of 70, who had suffered their cardiac incidents an average of three years prior to the study. Thirty of them practiced tai chi, while the remainder underwent typical care. Tai chi consisted of a one-hour exercise class, three times a week for 12 weeks. Others received weekly phone calls, written material about community-based physical activity and, for some, exercise. After three months, there were 34 reported falls, generally from slipping or tripping. Just five of them occurred in the tai chi group. This is solid evidence, though suggestive, that tai chi may be a great way to gain balance even after a life-altering health event, such as a stroke. The study used yang-style tai chi, the most popular in the U.S., which emphasizes health benefits that are both physical and psychosocial. Overall, tai chi led to better balance and improved strength, flexibility, and aerobic endurance. The psychosocial part of it arises with less depression, anxiety, and stress, and better quality of life. “Tai Chi exercise may reduce falls in adult stroke survivors,” American Heart Association, February 6, 2013.